I haven't been making too much lately, but I did take some time to sew together this fantastic lounge pillow recently and I absolutely adore it! It's made from the gorgeous new Rock 'n Romance line by Pat Bravo for Art Gallery Fabrics, and I made the free project pattern available over on the Art Gallery Fabrics blog today. I'd love to be able to share some of this amazing new fabric with a lucky reader! Want to win a fat quarter bundle of Rock 'n Romance? Simply leave a comment on this post and I'll randomly select a winner later this week. Since I haven't been around much this summer, I'd love to hear what y'all have been up to. What's your best memory of this past summer? Good luck, and keep rockin'! I love that pillow and fabrics and would love a chance to win! My favorite quilting memory of the summer was making a quilt for a friend's retirement. Thank you for the great giveaway. Summer seems a long time ago! But favourite memory was the Olympics - we were at the Opening Ceremony and it was totally unreal. Although the Fat Quarterly Retreat was a close second!! My favorite memory from this summer was my husband coming home after a year in Germany. 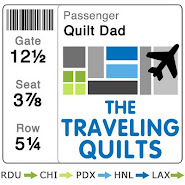 My favorite quilt memory was finally getting better at free motion quilting (not good, but better). I had lovely holiday at th e beach with lots of swimming and long walks. Also sewed up a storm, some quilts and zip pouches in pa particular. What fabulous fabric! favourite memory this summer...that's a long time ago already! visiting with my mother and sisters in Victoria BC in August, and finishing up a quilt (for one of my sisters) with my mother. I'd love some of this Rock'n Romance fabric! I've been drooling over it since it was released! The pillow looks great! I like the flowers you added. My favorite memories are taking the kids to the pool and going to a huge family reunion. Oh I love the Rock n' Romance! Thanks for hosting the giveaway! My favorite memory from the summer was the visit from my nieces (they're 1 and 3). We went to the aquarium, drew pictures in the driveway with sidewalk chalk, and made a castle cake, complete with Disney princesses and Queen Elizabeth - it was as awesome as it sounds!! It technically wasn't summer since we left two days after the first day of fall, but we surprised our 7-year old twins with a trip to Disneyland. What a great pillow! And what fun fabric! Favorite summer memory? Traveling to New Orleans and to Southern California! We went on two great camping trips! So much fun! I love that cushion! My summer memories revolve around the Diamond Jubilee and the Olympic/Paralympic games - it was a wonderful summer to be in the UK! P.S. And, of course, FQR 2012! I wasn't there but I followed every minute on Twitter, etc! Beautiful fabric! My summer memories are the Olympics too. Our son-in-law won a gold in the Olympics and our daughter was able to go to London with him. We were able to celebrate with them when they returned home. Love the cushion,,and the fabric! My best summer memories are all wrapped up in watching the grandbaby discover the world! Thanks for the chance to win. The cushion is great, such great colours. I remember doing plenty of EPPing while the Olympics were on and the Queens Diamond Jubilee. Oh and waiting for summer to start properly weather wise! My best memory of last summer was getting home from 7 weeks in the hospital/rehab place (don't ask). That pillow is great.........but then, everything you make is great or greater. Love the pillow. Best memory of the summer (what summer?) was a weekend away at FQ Retreat in London, camping in the pouring rain was memorable but not my best!! Lovely pillow and I adore the fabric line. Summer flew by uneventfully and the most exciting thing was getting ready for and looking forward to Sewing Summit. My favourite part of the summer was the road trip from Toronto to South Carolina with my husband and step daughter. I got to see lots of America I'd only flown over before, it was wonderful. I love this sophisticated pillow. That is one fab fabric line. My favorite part of the summer was our family beach trip. Vacation of course! Well nothing big this year! Just camping with the family! But it was still great fun! Oh I love the pillow! I think a highlight of my summer was taking Rachel's Handstitched class at Stitched in Color. Thanks for having the giveaway! The highlight of my summer was our family holiday to Ireland! Gee, was it time in Yosemite? Or time at the Eastern Shore? Or just time with my grand baby? Summer was spent by the pool with a couple weekend getaways. Lazy and relaxing just like I like it. Thanks for the giveaway! The best part of this past summer is that we actually had summer. The previous year my son was being treated for cancer so it was all a blur. 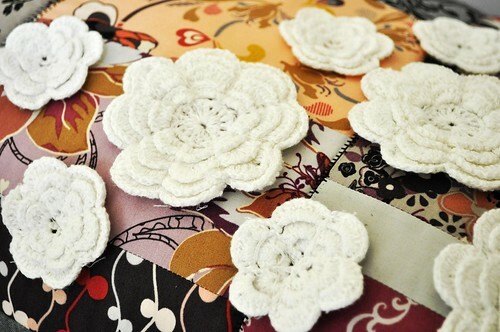 The crocheted flowers are just lovely, I remember my sister making an entire afghan with those. This fabric is so pretty! This summer we went to visit my husband's Grandma for her 95th birthday. It was quite a big bash! 95 candles is too many, even on two cakes. It was a little frightening. Oh, my goodness, that is SO lovely! We hosted a HUGE Family Picnic this summer. It was SO HOT, but fun. An Alaskan cruise was the highlight of my summer. Love the fabric, thanks for the give-away! My highlight of the summer was taking a train down to New Orleans. It was a great trip that holds a lot of memories. That is a great looking pillow! The fabric is gorgeous. Thanks for the opportunity to win. The summer was fabulous and I managed to get hooked on straight line quilting. I've made a few table runners for friends as gifts and now I am making one for me! Very simple but the quilting effect really makes the runners look fabulous. My husband and I went on vacation to Walt Disney World and then on the Disney Dream Carribean cruise. The highlight was spending time with him and not getting sea sick! Thanks for the give away - love your pillow! I have loved everything I've seen made in Rock n Romance. Awesome line. Love your pillow. 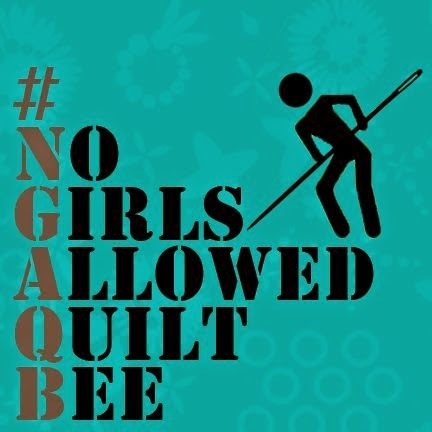 Been sewing a lot this summer but my favorite memory may be starting a modern quilt guild in our area. So excited. I love your pillow and this fabric line. I hope you find some time to do more sewing. Very cool. Thanks for the opportunity. Best memory of the summer=lots of family time. Awesome pillow, John! I love the Heartbreaker Rock n Romance colorway, but Dreammaker is right up there, too! And oh, the summer -- I have no idea what happened to it, where do those days go :D? I learned how to use my sewing machine, perhaps that's where the time went :D! Love the Art Gallery fabrics! Went back home for my 50th reunion from Grammar school. It was a lot of fun and since my husband had never been to Chicago we had some cool days in the loop too. Thanks for the chance to win some fabric.Hope your summer was great too! Very pretty pillow! I like the Dreammaker colourway. I had a week of staycation this summer to sew and garden and relax. The Dreammaker colorway is really awesome. Maybe because I like soft rock, but more likely it's those teenage dreams of romance. I got to help my son with his first garden. Those tomatoes he shared were awesome! Today my god daughter told me she wanted a pillow for her day bed for Christmas, and ie been searching for a good tutorial all day. I've just found it! I'd love to win the fabric to make this for her, but hey, if I don't, I'm buying it and making it anyway! Wow, I would love to win. This summer has been a wonderful one because it is the first summer in our family with two children running around, playing in the garden, mostly getting on and often falling out over nothing. Our second child just turned 2 this summer, so now big sis has a real playmate. Bliss. I love the pillow, but don't seem to have many fantastic memories of this summer - my sister was getting close to giving birth, but my niece didn't actually appear unti September. And apart from that, my summer was spent applying for jobs in the company restructure. All very stressfull, but they offered me the job of my dreams on Friday. So I've forgotten the whole summer now - autumn's much more spectacular. Love that pillow - Rock n Romance colors pop! Not much sewing took place this summer but I'm starting a new project with some Japanese fabrics. Great pillow! We had a great summer which included a week long house boat trip that was so fun! Thanks for the chance to win! Lovely fabric! My best memory was going to the coast over the Fourth of July and watching the fireworks on the beach! It was so crowded, but amazing firewords show. For me it's last winter as we're just coming into summer here in New Zealand. I think the best memory was when we got snow that closed down school for a few days, but didn't cause power cuts. There was an amazing snowman on our lawn and a roaring fire to keep us warm indoors. Love your pillow and of course the fabric is gorgeous too! This summer we had our 3 cousins from France visiting us in Canada - it was awesome, spectacular, and memorabled!!! The best memory this summer was taking my son swimming for the first time at his Babus' house (term for grandpas/grandmas/old people). He loved it and was such a chill baby! Best memory from this summer has to be Jubilee weekend in London with the Fat Quarterly Team and a whole bunch of lovelies at a certain quilt retreat! The best ever! Welcome back John! My fav memory from summer was my short week in Manzanita,OR where I met Monica and Violet in person and we shared a 3 hour coffee! Best memory of the summer: no after school grandniece sitting. We actually had some time for quilting and could leave the cutting station on the dining table without having to keep things away from curious kids. Thanks for the chance - great looking pillow for your girlie wild child. I follow AGF on Pinterest, subscribe to the blog feed newsletter, and liked on FB too. We did a bunch of family camping this past Summer with our tent trailer. We especially liked a weekend trip to a campground along a river. I finished two jelly roll race quilts, a black and white quilt for hubby and a pillow for Christmas! Very productive summer for me! ps...I follow AGF on Facebook and follow their blog, too! Best memory of summer...dancing on rooftop of Frank Lloyd Wright building in Madison, Wi, with hundreds of others. And wearing my own sundress creation. Summer... the best part was.going to the beach and playing in the sand with my daughter. And yes, I follow agf blog and on Facebook. The crochet flowers are a neat touch. A favorite summer memory was a hike I took in a local Hill Country park. Great pillow and love this fabric! I subscribe to Art Gallery Fabric newsletter by email and follow them on Facebook (username:jdgunthorpe at yahoo dot co dot uk). Thanks! I follow AGF on Pinterest, subscribe via newsletter and follow on facebook. P.S. Wild heart spirited in the Dreammaker colorway sings to me very loudly in Rock n Romance. It is awesome. My best memory was swimming in lake Michigan. My favorite memory from this summer was getting to choose my wedding dress while my mom and aunt came to town to visit me. Love what you did with the fabrics! Hmm my best memory, was sitting out in the backyard on a sunny day on a quilt I made while hand quilting another quilt I made while my husband hung out with me and read. I absolutely love this line!! I didn't have much of an eventful summer, but my favorite part was being able to visit my Granny. Since she's moved to another state I don't get to see her. I absolutely love this fabric! My LQS doesn't carry Art Gallery Fabrics (yet), but I am hoping to convince them they need to! My summer was filled with lots of days at the pool because it was so hot here! I'm actually really looking forward to snow, which is not normal for me at all! ;) Thanks for the chance to win! What a gorgeous pillow! Summer was our first one here, and it was hot and humid and gross :( But there were some great local festivals! Well it was winter here so I spent it huddled under a rainbow striped crochet rug as I was making it! I think I'm in love with with the purple hues in that collection, just love it. Thanks John!! Lovely pillow, the fabrics are so rich - gorgeous! Lovely pillow, thanks for the giveaway. My best memory of this summer was the olympics here in UK. Love the fabric! Great pillow, thanks for the pattern, and a chance to win. My favorite memory would have to be kayaking around the bay. Love the hearbreaker colorway, speaks to my Pat Benetar obsession in the 1980's....dating myself??? My favorite memory of this summer would have to be hosting my Dad's 70th birthday with all my sisters , their significant others and most of the kids! Favorite memory of the summer has to be our family's two week road trip from the West Coast to Yellowstone. I have fond memories of a similar trip when I was a kid and it was wonderful to be able to share it with my daughter. Thanks for the chance to win this fabric. I'm really liking the florals in this line - not super sweet and a bit edgy. Very cool! camping with church family!!! Very neat fabric giveaway--i've been eyeing this!!! Getting away from the heat to visit family! Good times. Love this fabric! But I have to mention, that I haven´t seen so handy man, who can sew. Nothing exciting going on here this summer but love this pillow and love this line! Love your pillow but I had to comment on The Borrowers book. I have the exact same book!!! I loved The Borrowers as a kid and I saved the book. Can't believe I saw it on your blog! I am glad to see you doing a bit of sewing! I love the video for this fabric line and would love to have some. Thank you for the chance. Gorgeous pillow!! My best memory of summer was getting to spend some much needed time with my sister in NC - precious time together! Thanks for the chance to win! The new baby learning to crawl... and giggle... :-D It was a summer full of baby fun. My youngest learning to walk! Now if only he would talk. Hmm. I really hope I win, I'm sooo in love with this collection, pat hit my personality spot in with this one!! I took a beginning quilting class in 1985 with my mother. I was a newlywed, and this was before rotary cutters and strip piecing. I learned the laborious way to cut squares and triangles from cardboard templates, and not surprisingly, I didn't have much fun. A few years later I got a rotary cutter and started quilting in earnest. However, measuring, tracing, cutting and matching seamlines with my beloved mom is a memory more precious than gold! I love these fabrics - modern and vintage all in one! I had a great time this summer on my first trip to the Festival of Quilts in Birmingham, UK. I'm just getting in to patchwork so had a great time looking at the beautiful exhibitions, going to workshops, and, of course, stocking up the fabric stash! Beautiful pillow and fabric! I took a family vacation to Tennessee this summer. It was beautiful weather to hike in the mountains, relax with family, and hit up a few (too many?) quilt/fabric shops. We went camping and it was an experience to remember. It started with our fellow camper next to us who got busted by a US Marshal and a car chase right before that. Our kids thought it was the most exciting thing ever! We finished a patio and walkways for our beautiful log cabin. We also wenting camping in our new RV, what fun! I love the grays and lavenders in this fabric. Totally in love with Rock 'n Romance!! Beautiful pillow - I want to make one just like it!!! Alas, summer has come and gone and the rains are arriving; just the perfect time to settle indoors and sew! Thanks for the opportunity to win a great prize! 10 days in Montana with the extended in-laws (no, really...). Thanks for the chance to win! Pretty pillow! Did you make the flowers, too? My favorite memory from this summer was seeing my older son getting married in Portland, OR and giving them their wedding quilt. Haven't heard much from you lately, John. Beautiful. My fav memory of this summer was On July 1..I retired!!!! 30 wonderful years of teaching high school math.Now time for quilting. A favourite memory from this summer was canoeing with two of my friends an the lakes close to my house. The woods were magic and it was sunny and hot... Just lovely! A favorite summer memory would be actually going on a vacation this year. We don't go often and it was so much fun! Even if it was only for three days. Love the pillow and thank you for the chance to win. We went to AZ, to visit a friend. My first time there and I loved it. so different than the Northeast where I live. Thanks for the chance to win some of that yummy fabric Rock'n Romance! I didn't do much different this summer, work, home, sleep. BUT...! I have just moved in with my 90 year old Dad and looking forward to spending time with him. Good Quality Time!!! My favorite memory of the Summer was taking my oldest to a fantastic pool complex all by ourselves. We splashed, played, and went down waterslides together. Loved the time alon with him!! I do believe that my favorite memory from this past summer was watching our daughter discover that grass is an okay plant to walk on. We encouraged her by placing her a few feet away from her pool. Once she realized that the grass was just fine to play/walk on we were off. We had a baby in the middle of June so I don't really remember much of this summer! It's all a haze! The best memory is seeing the kids faces as they saw their new brother for the first time. I have been working on EPP hexis all summer! I am totally addicted to everything hexi now :) Thanks so much for the chance to win, you rock! I would love to win! My husband and I bought a house this summer and we did some serious remodeling... Doing it ourselves.. Wow hard work! I'd love to win this; I'm just starting out in quilting. Awesome fabric! Thanks for the opportunity to win! My favorite memory this summer has been watching our almost 4 year old play in the sprinkler - he loves the water. Rock on! Thanks for the chance to win. Favorite part of my summer was running in some road races where I thought the heat would be too much, but actually getting my best times. Now it's "staying in the house" time and quilting time. Love the fabric and the flower touches. Very creative! I would love to have some fabric...summer...hmmm, it was so long ago...staycationing by the pool was most of the summer...I think! Fantastic issues altogether, you just won a logo new reader. What might you suggest about your put up that you made a few days ago? Any sure? This is fantastic! I love the colors in the quilted pillows. Thank you for sharing! How cool and funky are those?!? Love the pillow with the added trimmings. July is my favorite part of summer; the lilies were in full bloom and the humming birds came to visit! Hi John....just an Aussie stopping by to say "Hi" from ChrisW Designs! LOVE your fabrics! Thanks for sharing! Summer is just starting here in Australia and I am loving it... afternoon walks with hubby and our little girl after hubby gets home from work when we still have 2 or 3 hours of sunshine. Yes we go to bed far to late and eat dinner far to late but I love the sunshine in the evening. These are awesome!!! I really love all these. 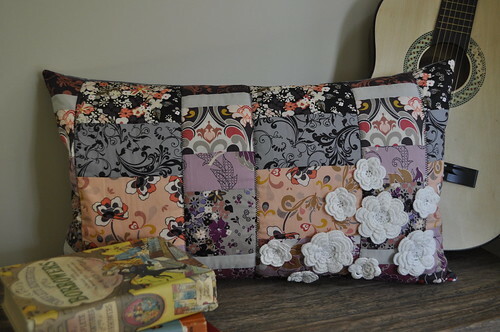 I love the look of these pillows.....the flower accents give it a true accent of modern quilt patterns. Really a great lounge pillow.. I do like that pillow pattern. Where have you gone? Hope all is well with you and your family. Wedding in Florida for my beautiful daughter. Are we suppose to leave comments on this post for the giveaway? Blog doesn't seem to be current, but here goes anyway. Thanks for giving us a chance to win this great looking book! My favorite memory from this past summer is moving my daughter from Florida to Washington - only a 5 hour drive, not 5 days!!! THe book looks great! I want to win it as I am currently lacking inspiration. Did you crochet the flowers, too! Very cute pillow. Our family reunion was the best part of my summer. looking for the giveaway for beautiful quilts from top bloggers?? took me here? you are on the list. would love to get a book. Wow, I would love to win this book. Thankyou for the opportunity - am I in the right blog? Our family took an awesome trip to Southern Utah this past summer. Is this the right post for the giveaway? If so, yep, I'd like to win the book too.